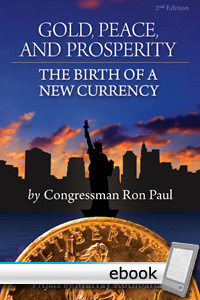 Ron Paul has been the leading champion of sound money in the Congress. Here he explains why sound money means a new gold standard. The monograph is written in the clearest possible terms with the goal of explaining the basics of paper money and its effects of inflation, business cycles, and government growth. He maps out a plan to bring about a dollar that is as good as gold, one that would be protected against manipulation by government and central bankers. Part of that strategy is the minting of a new gold one but the more far-reaching plan involves a redefinition of the dollar and complete monetary competition. This monograph first appeared in 1981, and it has been in wide distribution ever since.